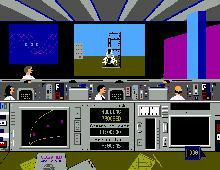 Apollo 18 is an early space mission simulation by Artech, converted from the C64 to the IBM-PC by Ted Gruber Software. Problems might occur on fast computers. Try a slow-down util. Also don't forget to download the manual, you won't get far without it. Included in the archive is also the hi-res version. From Diana Gruber's home page (Ted Gruber Software): "The shipped version ran at a 320x200 resolution, but for a few dollars more, you could mail in a postcard and get a high-resolution (640x350, 16 colors) EGA resolution, considered revolutionary at the time. It was written in Fortran and assembler. Can you imagine that?" Overall, a nice space simulation that focuses more on playability than on accuracy or realism. Fun for a while, but die-hard fans of the subject should check out Microsoft Space Simulator or Orbiter instead.